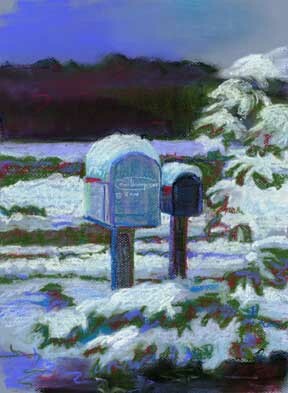 "Winter Mailboxes" is a 15 1/2" X 11 3/4" original pastel painting on Mi-Teintes paper. "Winter Mailboxes" is a limited edition, giclée print from an original pastel painting by Carol Thompson. The edition includes 3600 authorized, signed, limited edition prints (3500 numbered and 100 artist proofs). Release date is Decembet 2000. Image size and substrates vary. All prints are signed and numbered by the artist and include a certificate of authenticity. Paper prints are shrink wrapped on foam board. Canvas prints are coated with a protective spray. Color of images may vary slightly from the actual artwork due to variations in monitors, so if color is a critical factor, you can order a small sample to verify color accuracy. *Please allow up to 2 weeks preparation time for your artwork to be shipped. Transit time will vary depending on your location. Some print images may be artistically cropped or extended to accommodate the size and/or shape of the artwork. Note: Prices do not include framing and/or matting. WARNING: Copyrighted material. All rights reserved. Artwork may not be duplicated in any way without the expressed written consent of the artist. Any reproduction for any purpose is a violation of United States copyright laws.